This recipe makes 5 - 6 servings and is the most basic version of this dish. You really can add whatever you like into this - any type of meat or vegetable. It works really nicely with diced beetroot. This dish is really lovely after a long day's travelling or work as it can be frozen and just needs frying in a little bit of butter before serving. For the British among you, think ham, egg and chips, just in teeny tiny pieces! 1. Dice the potatoes, onions and cooked meat into about 1cm cubes. 2. Stir-fry the diced potatoes in a little oil until browned and crisp. Remove them from the pan. 3. Melt the butter and gently fry the onions until they are soft. Add the meat and brown it for five minutes. 4. Reduce heat to low and add the potatoes, mixing until warm. While you are doing this, fry the eggs in a separate pan. 5. 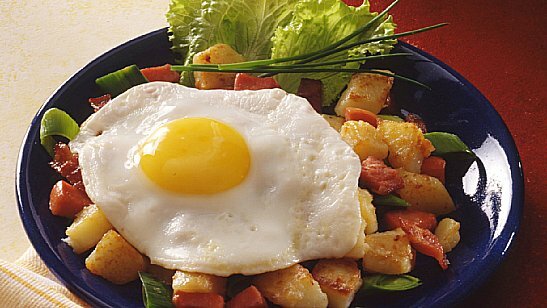 Serve with a fried egg on top of each portion. These are one of my favourite things. They are so simple to make and go really nicely with a cold glass of milk or some coffee. You can alter this recipe fairly easily according to taste, for example, the coffee can be substituted with water if desired. It is also really funny to make with children since it is easiest if you mix all of the ingredients by hand, a lovely excuse to make a mess! 3. Once the mixture is thoroughly blended pour some pearl sugar or dessicated coconut or whatever you fancy onto a plate. Using your hands, form balls out of the dough (they can be any size, you can also press the whole mixture into a cake tin, cover with melted chocolate and sprinkle coconut on to make a cake version!) Roll the balls around on the plate until fully coated. 4. Leave them in the fridge to cool. Eat them with a great big glass of ice cold milk! I hope you enjoy them! Please remember to leave a comment if you have any questions or suggestions for me!